Our mission is to provide complete multi-monitor solutions that work together seamlessly — from multi-screen desktop displays (Zenview), to desktop workstations (Stratosphere), to notebook docking stations (SideCar), to multi-monitor software utilities (Zenview Manager). Beyond complete solutions, we also offer the industry's highest quality components at the industry's best prices. Check the specifications before you buy: you can't buy a better multi-screen display than we offer, and most of our displays are also more affordable than those of competitors. Other companies charge top dollars for fancy plastic packaging housing last year's consumer-grade core technology. We test hundreds of different components and offer only the industry's top-of-the-line, professional-grade LCD and computer graphics technology. We integrate it all with our exclusive Zenview Manager software that fully extends Microsoft Windows for multiple monitors. Our most popular products are our Zenview multi-screen display systems, which integrate up to seven LCD panels in an almost seamless desktop display. Compatible with both Windows and Macintosh computers, Zenview displays offer an enormous multi-monitor workspace, with support for up to 4800 by 2400 combined screen resolution. With up to 1000:1 contrast ratio and digital DVI input options, Zenview displays provide top quality in a space-saving design that eliminates the desktop clutter of multiple display stands. Packaged with Zenview displays are our exclusive Zenview Manager multi-monitor software utilities, which enhance the productivity of Windows users with multiple monitors. Our industry-exclusive SideCar docking stations work in tandem with a standard Windows notebook or Apple PowerBook. An external chassis attached via the PC Card slot, the SideCar supports up to four external displays. SideCar systems offer productivity of using multiple monitors, combined with the mobility of a detachable notebook. With data and applications always in one place, users have the best of all worlds – mobility and multi-monitor power. Our Stratosphere line of multi-monitor desktop workstations offer ready-to-run systems supporting up to 16 screens. All Stratosphere workstations offer fast PCI Express graphics. Digital Tigers offers a full range of floor-standing tower workstations, including the flagship Stratosphere Elite and Stratosphere Enterprise, which offer dual Intel Xeon processors for top performance with demanding multitasking applications. Stratosphere Pro and Express models offer power-user features based on a platform powered by Intel Pentium 4 and dual-core Pentium D processors. Desktop Stratosphere Z models provide tremendous multi-monitor power in a space-saving package that leaves room for the monitors on the desktop. Our exclusive Zenview Manager multi-monitor software utilities fully extend Microsoft Windows for multiple monitors. These utilities enhance usability through such tools as a Smart Taskbar dedicated to each display and showing only the running applications on that display. 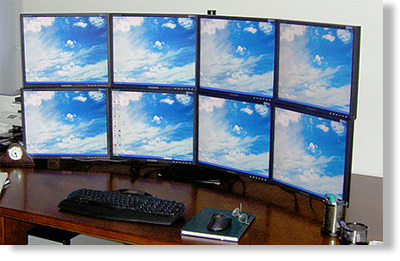 Other features include quick move buttons (enabling applications to be popped easily from one display to another), multi-monitor wallpaper and screensaver (enabling each display to have its own wallpaper and screen saver), and the ability to manage more than 10 displays (the normal limit under Windows). For users and organizations running a standard array of application windows, Zenview Manager even enables the computer to start up with many different applications automatically loaded and precisely placed in a preferred multi-screen layout. 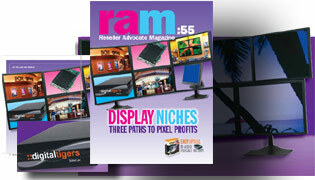 Reseller Advocate features Digital Tigers! Digital Tigers, Inc. was founded in 2001 and is based in Atlanta.